Savelina Fanene is an Australian-American wrestler, billed by the WWE as standing a towering 6 feet tall. 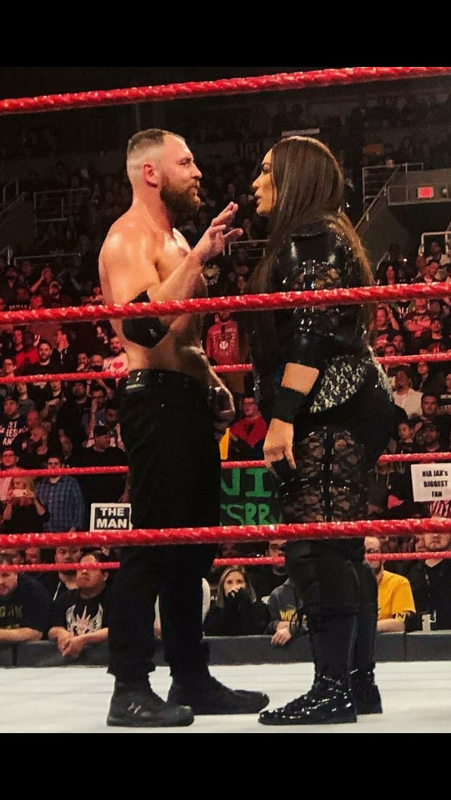 She may be a fraction under 5'10", now that she stood with Dean Ambrose who's more 6'0.25" IMO than his 6'0.75" listing. Didn't really look too much shorter than 6'4 Randy Orton. Rob, I’ve heard she was right at 6’0” in basketball sneakers? Possibly a 5’10.5” person who stands like 5’11.75” in basketball sneakers? There is a chance she could have measured close to 6ft in a Air Jordan. 5ft 9 looks too high, at least an inch less than that. She’s 5’11.5”- 6’0” around 245 lbs. She looks a couple inches shorter than hhh and rock in pictures together. She has more than just 3 inches on Rousey. What pic did you get that from? 3 inches taller than Ronda Rousey (legit 5'6.25-5"). She’s at least 5’11. She is 4 inches taller than Lana who is 5’7. She is not even 5'10" to me she looks around 5'9" or 5'9.5"
i think it would be better and easier if you just measure celebrities. but any thoughts? I'm not sure many would agree to that. I Knew she wasn't 6 feet. She looks fairly taller than most female wrestlers,well Charlotte and Maryse won't be too small next to her but still she would look clearly smaller if ever compared to say John Cena,just nowhere near 6'.Could have understood a near 5'11 guess though. Rob's estimation seems accurate to me. WWE loves to inflate height by 2-4 inches, it's pathetic. Listed at 6-0 when she played HS basketball. Can't find a roster listing for her college basketball days but I'll keep looking. @MJKoP She's billed by wwe at an astonishing 272lbs which is hard to believe in itself. Then is Enzo Amore 5 ft 8 ? I'm not sure Enzo looks ever as short as that. I’m shocked to hear she’s only 5’10, could have sworn she was a legit 6’0 she always appeared to be a good amount taller then Kurt angle who’s 5’9.5” I would have pegged her 5’11.5-6’0” the other divas must be really short because she always towered over everyone. From what i've seen there isn't a whole lot of difference between Nia and Charlotte, both are definitely strong 5'9/10 women, i'd probably give Nia the edge though, a smidge over 5'10 possibly. How about her weight? She's listed as 240lbs(along with the six feet). I'm sure she is somewhere in that weight range. I think 5'10" is about accurate.